I used my Buddies fabric to whip up some pram bedding this morning. Just a simple stretch sheet and blanket with a velour reverse. 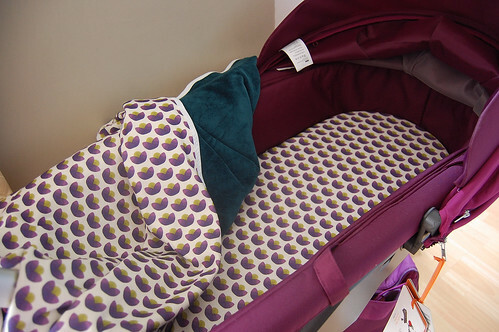 I'm quite pleased with how well the colours of my fabric tie in with my lovely new purple pram. You know I could ponder a while on the subject of prams, and the fact that some people seem convinced they have mystical powers that can kill babies, while others seem to think the fact that I have one all set up and ready in my kitchen implies some kind of optimism on my part. The truth is, it's a beautiful thing, but it's just a thing, it can't kill my baby, it can't guarantee he'll live. It sits quietly under a photo of Florence, and every now and again I look at it and hope I get to use it very soon. Wow, I am blown away by the color combination! It looks absolutely awesome!! And I am, as I always silently do, sending lots of positive energy your way. Lovely pram Jeanette, and the bedding is gorgeous. So beautiful, like all of the things you make. that print is gorgeous! Did you buy it online? Youre right a pram is just a thing. Not an omen or a sign. Just a thing. Thank you Roof for the blogger award. Green Mama, that fabric is my own design, but you can buy it from spoonflower, just click on the piccie in the post and it should take you to it. I had it printed on organic interlock, but there are other fabrics to choose from. Poor Otto never had sheets in ours as I was too tight to buy any!